Be the first to share your favorite memory, photo or story of Everlean. This memorial page is dedicated for family, friends and future generations to celebrate the life of their loved one. Everlean Fairley was born in Benndale, Mississippi on April 30, 1940, to the late Mr. Dan and Mrs. Lorena Fairley. 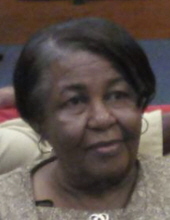 She was united in marriage to the late Mr. Starling Perryman, Sr. Everlean accepted Christ at an early age and became a member at Sweet Pilgrim Baptist Church until later moving to Biloxi, MS. There she joined Tabernacle Baptist Church until her health began to fail her. Everlean owned and operated Benndale Café for years before retiring from Winne Dixie in Biloxi, MS. She had a passion for cooking, gardening, fishing, traveling, caring for children, the elderly, and enjoying time with her family. She leaves to cherish in her memory, her five sons: Starling Perryman, Jr., York, AL, Otis L. Perryman, Bobby Earl (Glenda) Perryman, Benndale, MS, Lee C. Perryman, Biloxi, MS and Edward E. Fairley, Houston, TX; three daughters: May Dean (Robert) Payton, Biloxi, MS, Doris E. Fairley, Houston, TX, and Luella S. Perryman, Biloxi, MS; one brother: Reverend Charles (Minister Glenda) Fairley, Benndale, MS; three sisters: Ruby Mae ( Frank) Perryman, Nettie Jones, and Georgia Ann (Reverend John) Morris, Benndale, MS, two sisters-in-laws: Gladys Ree Fairley and Glenda Jean Fairley, Benndale, MS; one brother-in-law: Jeffrey Fairley, Benndale, MS, 24 grandchildren, 27 great-grandchildren and a host of nieces, nephews, cousins and friends. Arrangements have been entrusted to the professional staff of Richmond August Funeral Home. To send flowers or a remembrance gift to the family of Everlean Perryman Fairley, please visit our Tribute Store. "Email Address" would like to share the life celebration of Everlean Perryman Fairley. Click on the "link" to go to share a favorite memory or leave a condolence message for the family.